Call for Papers and mark your calendars! 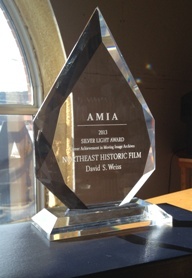 The highest honor of the field, the Silver Light Award,was awarded to Northeast Historic Film in 2013 by the Association of Moving Image Archivists. This recognition is for many people including staff over 27 years, many hundreds of film and video donors who built our outstanding collections, and our supporters and colleagues.